The elegant and graceful design of this handcrafted, Western style console will add sophistication wherever it is placed. This console features lovely, curved, cabriole legs that are joined by a “H” shaped stretcher. The lower understructure of the console is connected by a gorgeous, hand turned crossbar. The console has an open, wide top with a classic, straight, top rim. Under the top rim of the console is a small, rectangular drawer, with a hand forged, iron handle in its center. 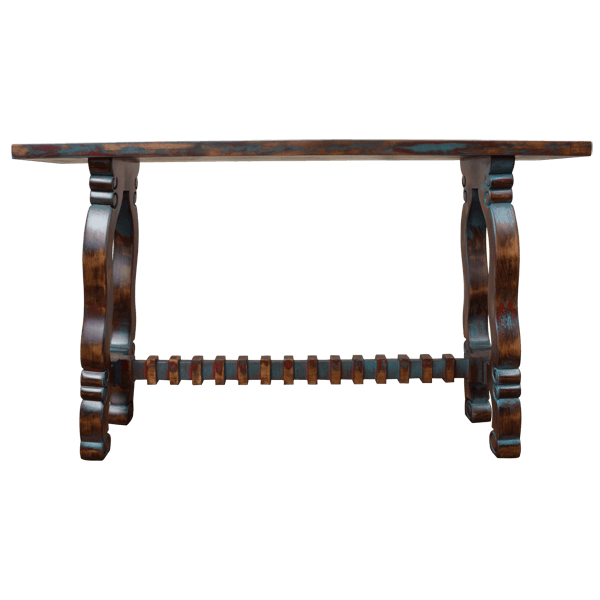 The console has a lovely, antique, brown finish, and it is made with the best, sustainable, solid wood available. It is 100% customizable.